Mitchell. It's a name well known among western vehicle fans. As our current "Featured Vehicle," this near-pristine Mitchell brand farm wagon is a rarity today, still boasting the majority of its original paint, pin striping, and selling dealer signage. With high, 52" rear wheels, a 38" wide box, and original brake, it's currently undergoing a transformation into a competitive chuckwagon by Kathy Christensen of Midwest Buggy in Lockney, Texas. According to Christensen, "Mitchell has a great western history and strong reputation. Combined with the excellent condition and originality of this wagon, we're looking forward to a great season of chuckwagon competitions." In the contests, wagons are scored on condition, originality, equipment, and detailed features. Multiple judges evaluate the vehicles as well as the prepared food from each wagon to determine the winning contender. It's a highly competitive series of events surrounded by a spirit of camaraderie unmatched by most other contests. For more information on chuckwagon cookoffs, visit www.chuckwagon.org. Additional information on the Mitchell wagon company can be found from a number of sources. 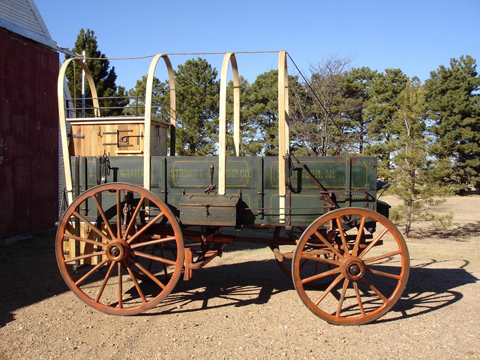 Throughout it's history, Mitchell has often been referred to as the oldest wagon company in America. While the roots of the company do trace back to 1834, there were other companies in the east with even earlier dates of establishment. Like other firms, Mitchell suffered its own series of financial hardships and growing pains in the early years, but ultimately triumphed into a major western vehicle competitor. Mitchell built a broad line of vehicles including farm, freight, stage, and spring wagons as well as buckboards, delivery wagons, hitch wagons and buggies. They even had their own line of wagon grease. Mitchell's history not only covers the majority of the development of the old west, but it also played a significant role in the transition from horse drawn vehicles to electrics and gasoline engines in the early 1900's. Mitchell was purchased by the John Deere company in 1917 and marketed for several more decades before ceasing operations. As we continue to celebrate the legendary wheels of the old west, we'll be showcasing even more vintage western vehicles on a regular basis. In the meantime, if you know of a particularly nice set of wheels or interesting western vehicle story you'd like to see here, feel free to drop us a line at info@wheelsthatwonthewest.com We'd love to hear from you!